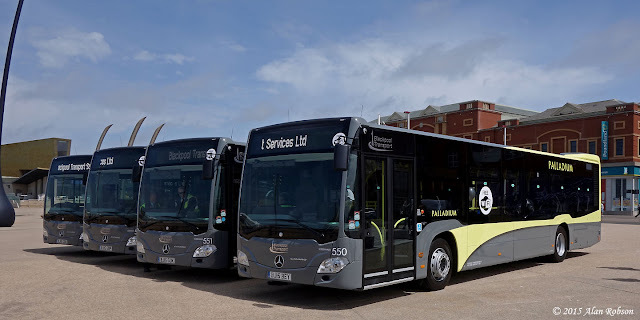 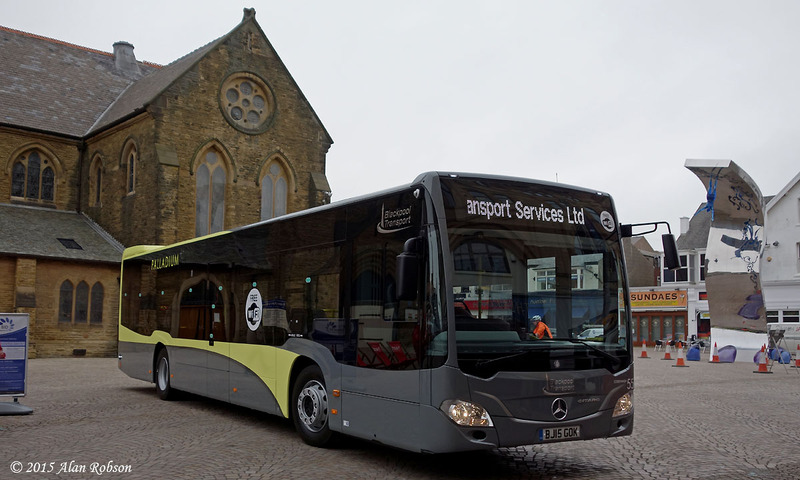 Blackpool Transport's new Palladium branded Mercedes Citaros made their passenger service debut on Sunday 31st May. 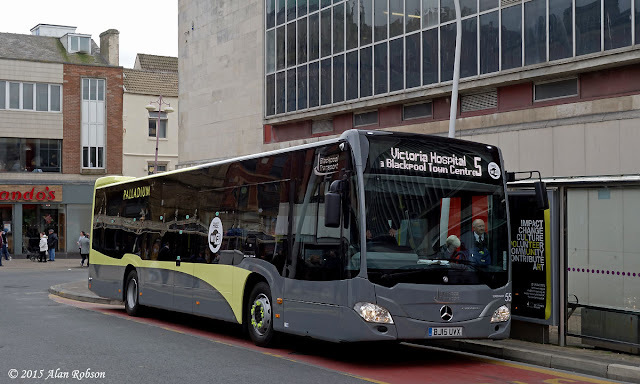 As expected the vehicles were in use on Service 5 between Victoria Hospital and Halfway House, and with it being a Sunday service only three buses were required to operate the route, these being 557-559. 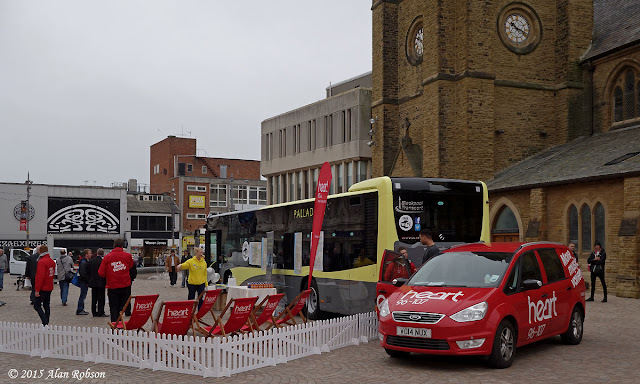 Blackpool Transport's fleet of Optare Excels saw their last day of normal passenger operations on Saturday 30th May. 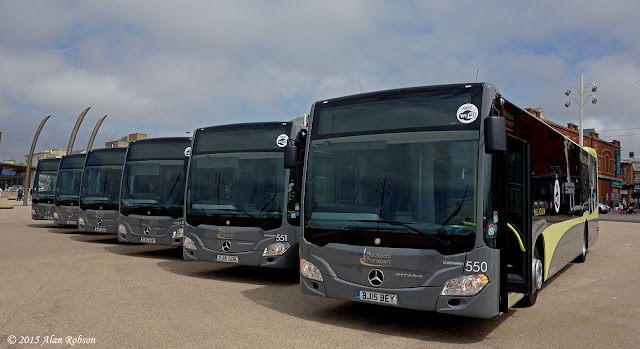 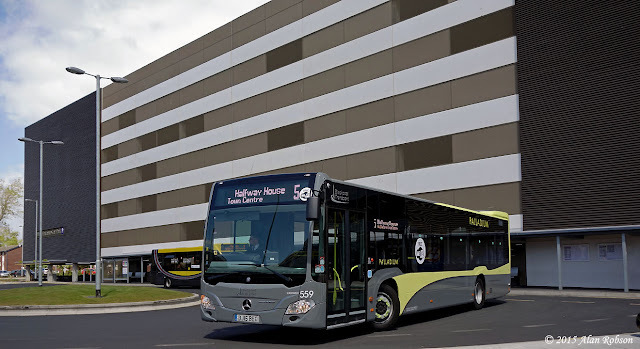 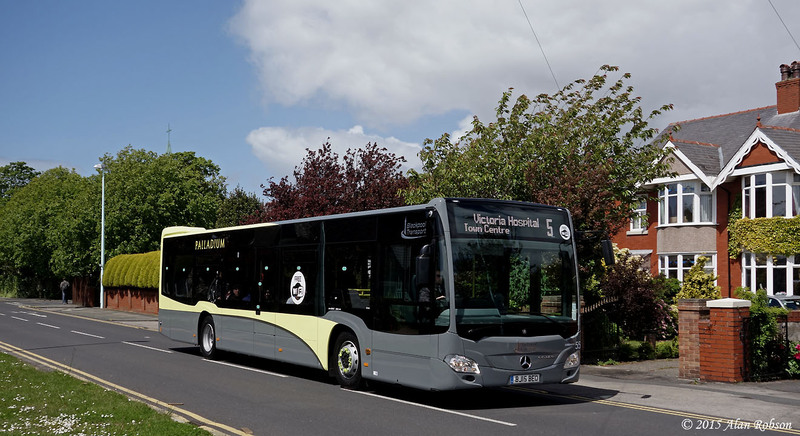 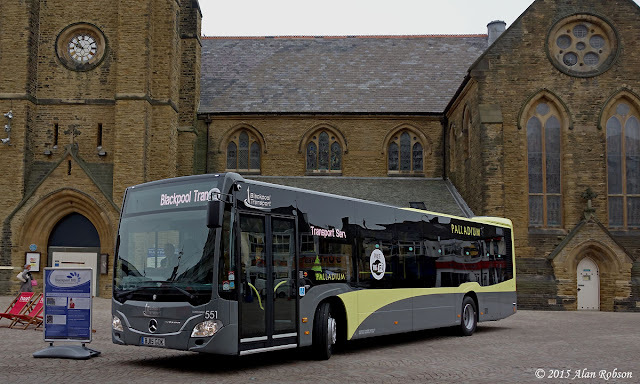 With the new fleet of Mercedes Citaros due to enter service the following day, the Excels saw their last hours out on the 2, 2C and 17 routes, with all nine of the surviving buses being used, ie 216 and 218 to 225. 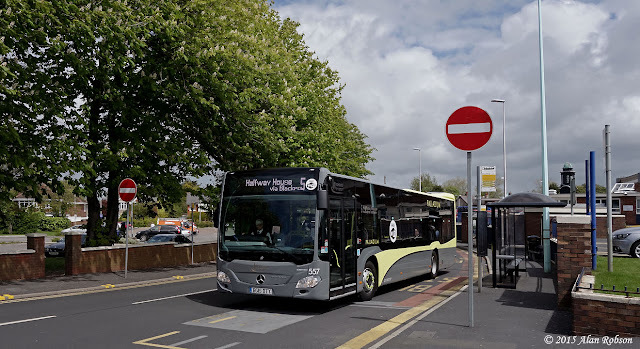 It is understood that five of the Excels are to have a temporary reprieve until after the planned BTS route changes that are due to come into effect at the end of June. 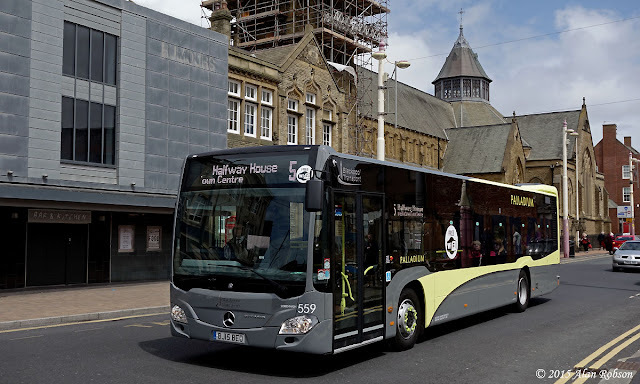 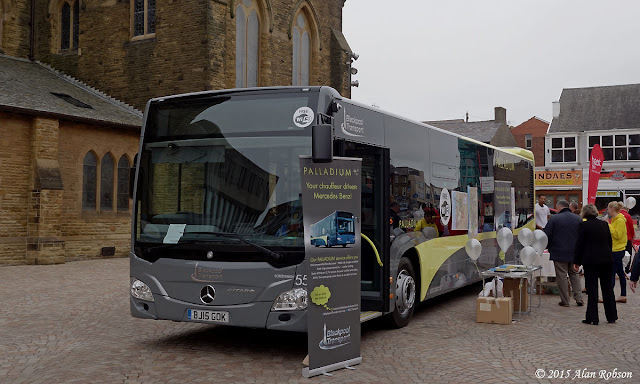 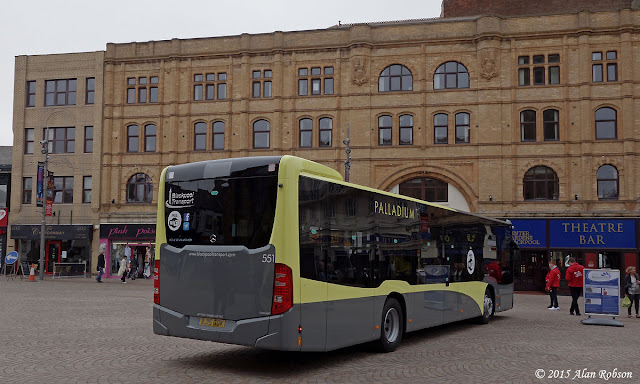 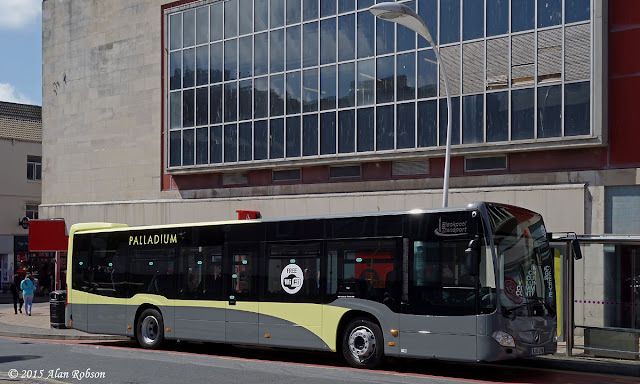 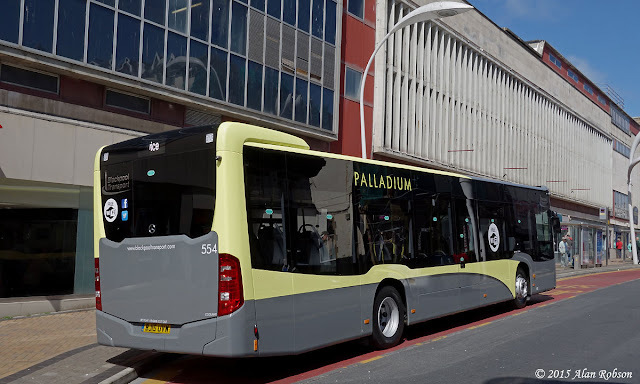 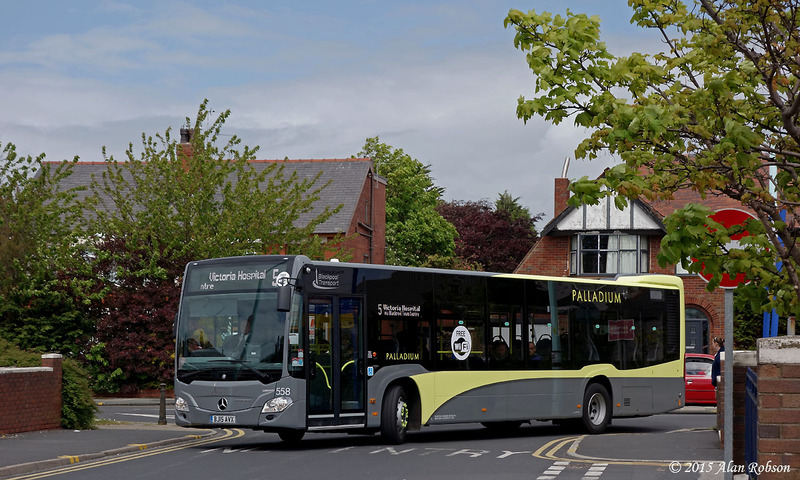 Mercedes Citaro 555 was parked on Corporation Street on Friday 29th May, allowing passing drivers the chance to familiarise themselves with the controls and features of the Palladium branded buses. 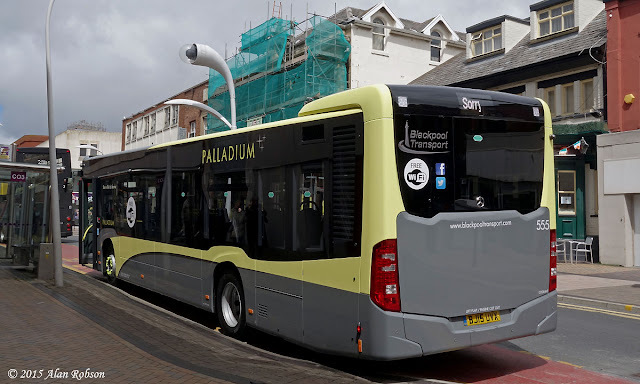 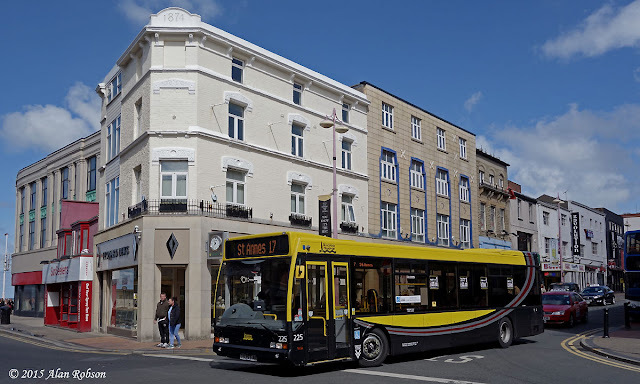 Since the launch of their new Palladium branded Mercedes Citaros last week, Blackpool Transport have been parking one of the new buses in Blackpool town centre, so that BTS bus drivers can look over and familiarise themselves with the new vehicles before their inauguration into passenger service on route 5. 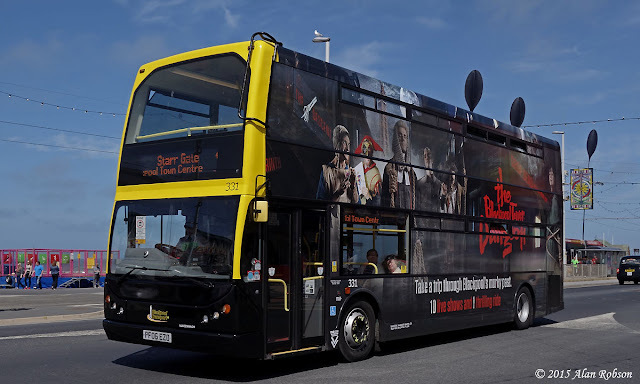 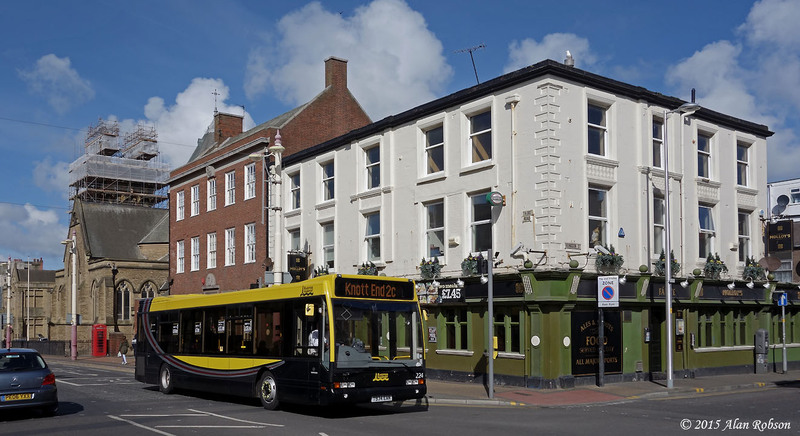 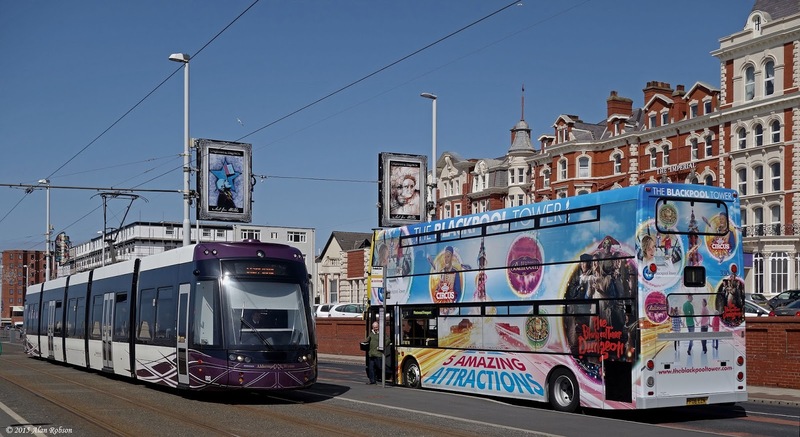 A fourth Blackpool Transport Dennis Trident has recently received a new overall advert. 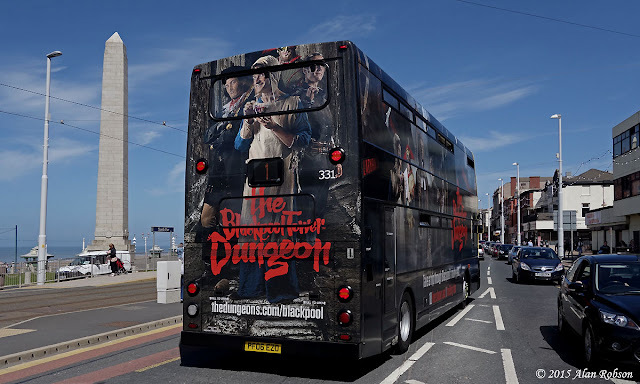 Trident 331 is carrying vinyl advertising for The Blackpool Tower Dungeon, unfortunately this is yet another black based advert. 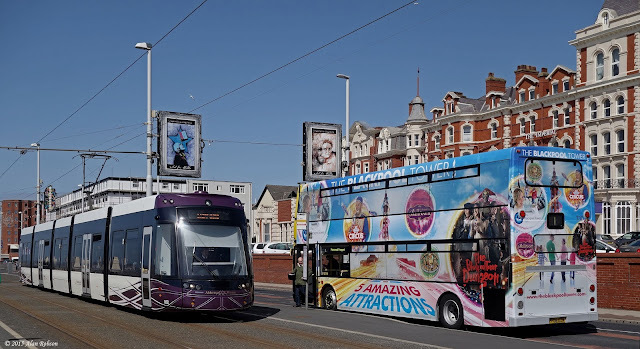 Flexity 002 southbound at the Imperial Hotel passing northbound Dennis Trident 330 which is carrying the new 2015 overall advert for The Blackpool Tower. 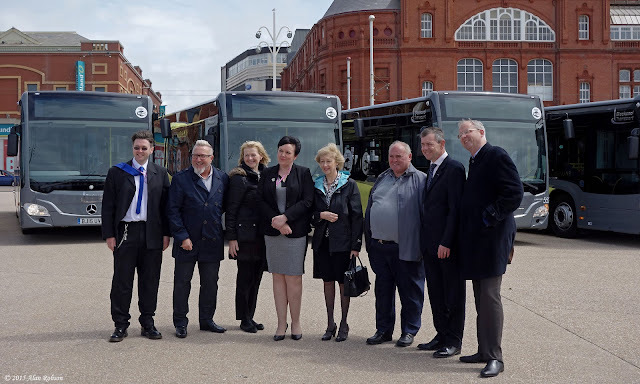 A unique event took place on the River Mersey at Liverpool on Bank Holiday Monday 25th May. 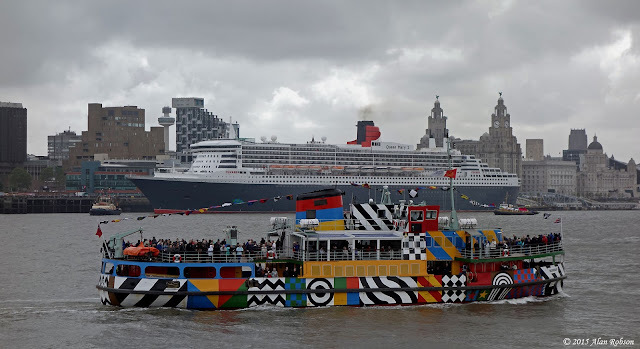 To celebrate the 175th Anniversary of Cunard Line, all three of Cunard's ships were due to meet on the Mersey in a spectacular coming together of the whole fleet, which is unlikely to be seen again in Liverpool for a very long time. 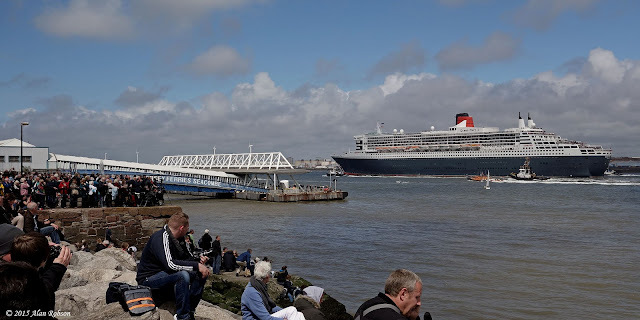 RMS Queen Mary 2 had arrived in the port on the morning of the preceding day, Sunday 24th May. 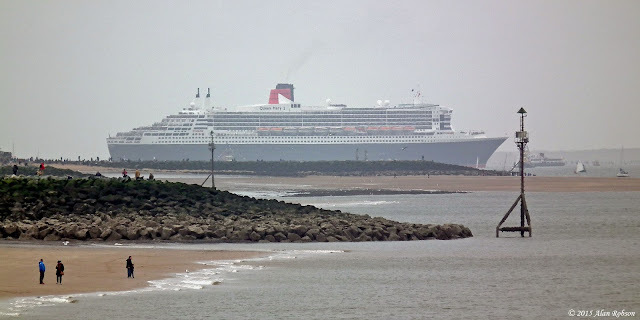 At 1045 on Bank Holiday Monday, the Queen Mary 2 departed from the Pier Head and made its way down to the mouth of the River Mersey, where it performed a 180 degree turn to await the arrival of the Queen Elizabeth and Queen Victoria. While the Queen Mary 2 remained on station at the mouth of the Mersey, she was passed by the Queen Elizabeth, which had sailed from the Orkney islands in Scotland, and the Queen Victoria, which had arrived from Guernsey in the Channel Islands. The Queen Mary 2 took up her position at the rear of the flotilla and all three ships sailed line astern along the River Mersey towards the Liver Building, they then slowed to a stop adjacent to the Echo Arena and performed a choreographed 180 degree turn until they were facing north. The ships then slowly manoeuvred into a line abreast formation in the centre of the river opposite the Liver Building. 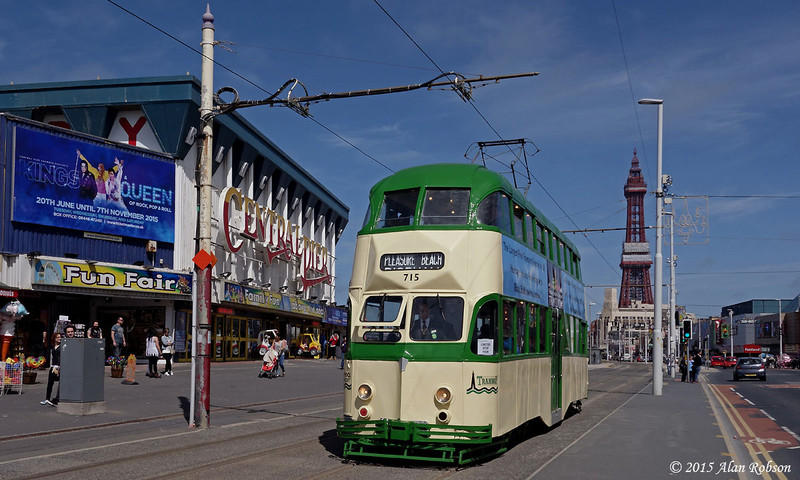 As the ships held their position mid-river, the RAF Red Arrows aerobatic display team made a flypast overhead on their way to a perform a display at Blackpool. 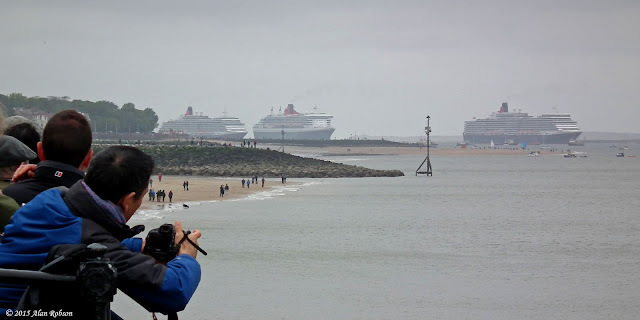 At 1410 the Queen Mary 2 departed the city to continue with her cruise to Guernsey, while the Queen Elizabeth berthed at the Pier Head landing stage and the Queen Victoria remained anchored in the centre of the River Mersey. 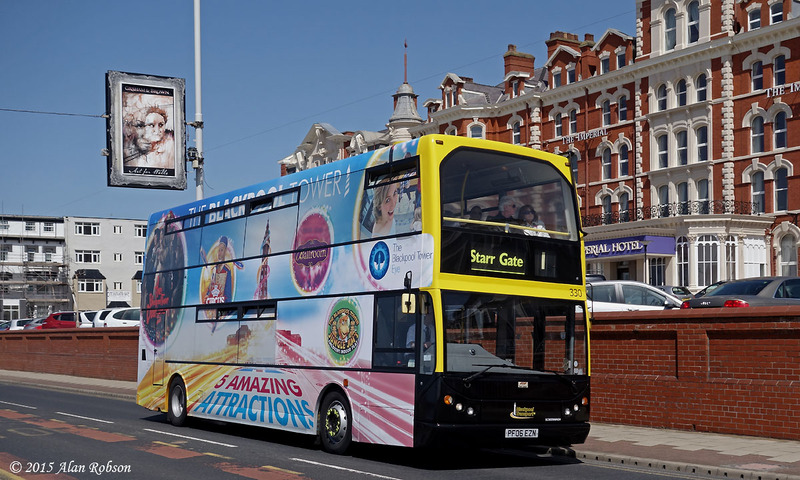 A few facts about the three Queens, the Queen Elizabeth and Queen Victoria are both cruise ships that weigh around 90,000 tons and have a capacity of just over 2000 passengers. The Queen Mary 2 is a full ocean going liner and weighs in at 148,000 tons with a capacity of 2,600 passengers. The Queen Mary 2 is the last major ocean liner to be built since the QE2 back in 1969, and was constructed with 40% more steel than an equivalent cruise ship in order to be able to withstand the rigours and storms of regular transatlantic crossings. 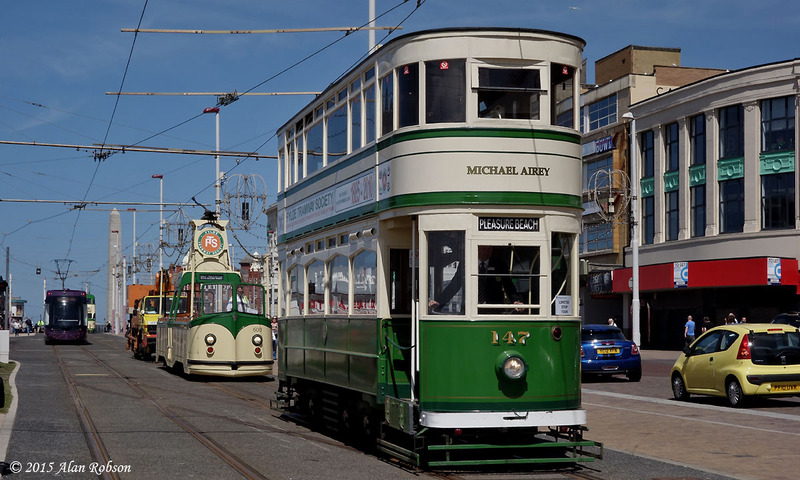 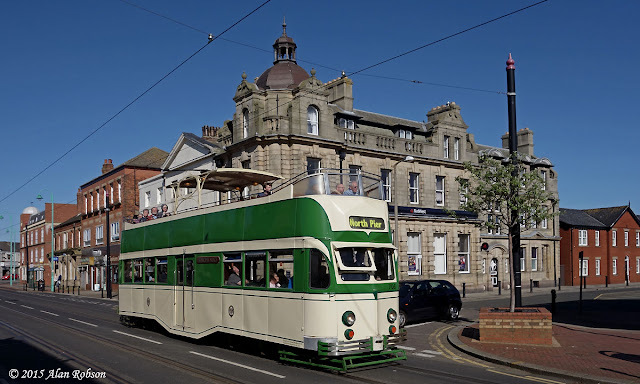 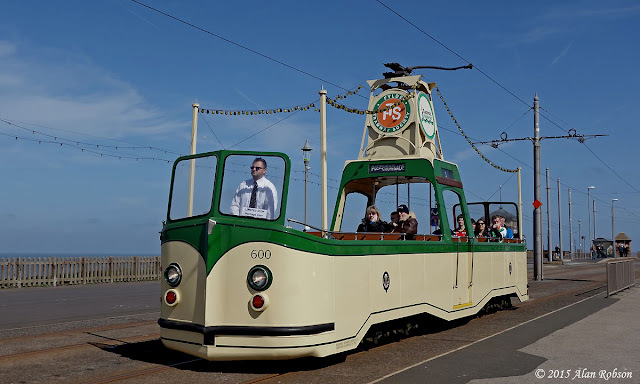 The heritage trams on Saturday 23rd May were running to the green timetable, which uses four trams nominally operating every 20 minutes between the Pleasure Beach and Little Bispham. 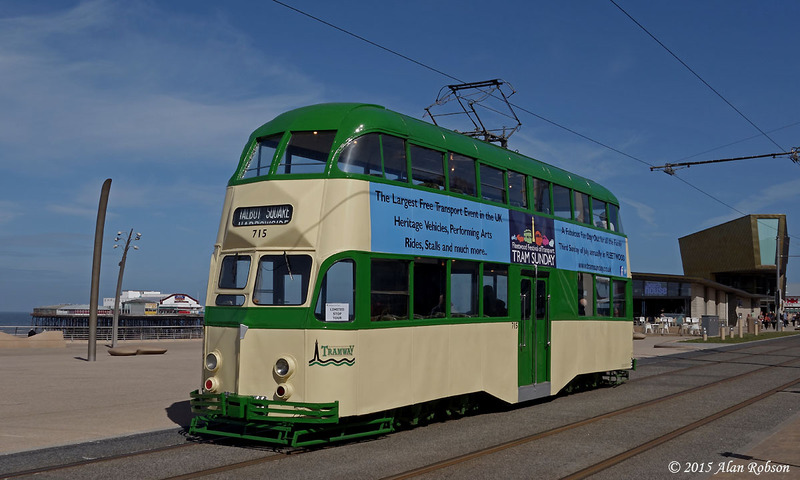 The theme for the day was "Green & Cream", with trams 147, 600, 648 and 715 running the service during the morning, Balloon 715 has also received full length between deck adverts for Tram Sunday in Fleetwood. 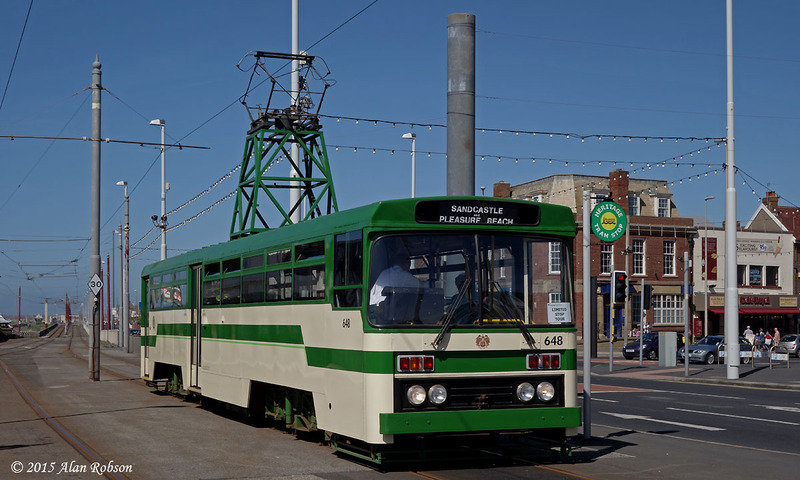 Shortly after 1330 two tram substitutions were made, 147 returned to the depot with compressor problems and was replaced by Boat 230, 600 also returned to Rigby Road depot, being swapped for 706 Princess Alice. 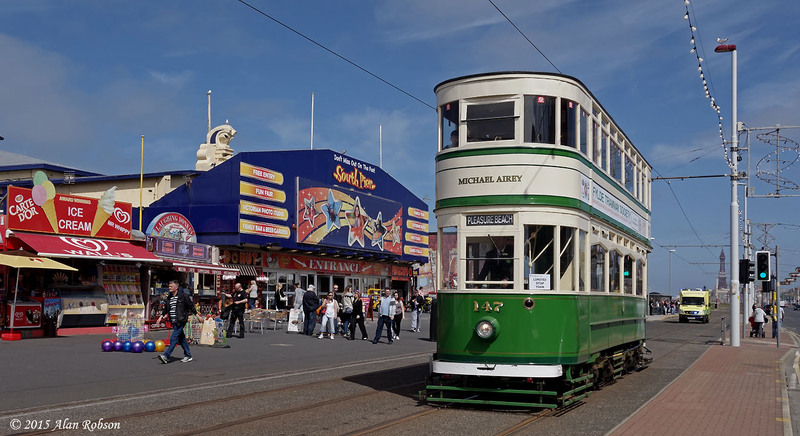 Later in the afternoon Balloon 715 also began to have compressor problems and was replaced in service by Brush Car 631. 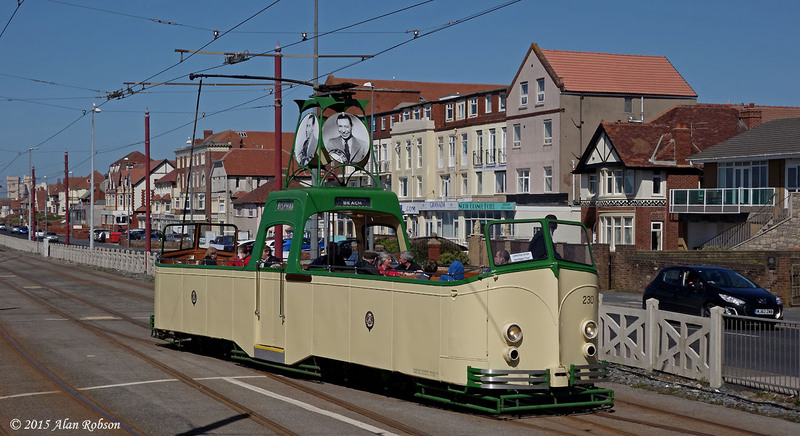 The 1610 departure from the Pleasure Beach offered a run through to Fleetwood Ferry, this being operated by 706. 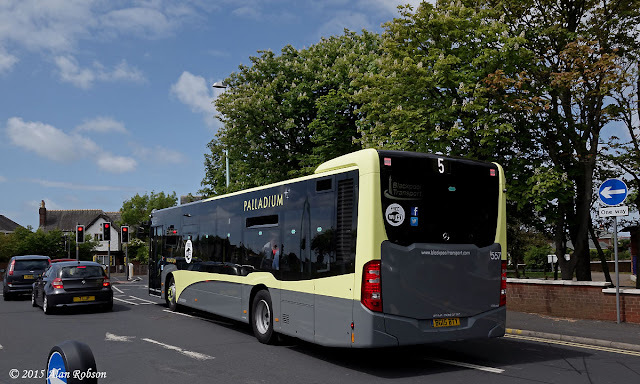 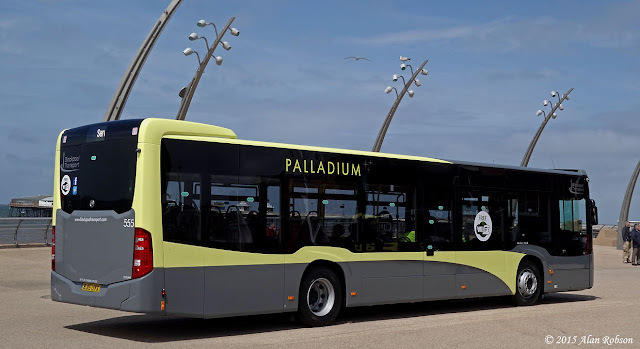 After yesterday's official launch event for Blackpool Transport's new Palladium branded Mercedes Citaros, today it was the public's turn to be introduced to the new buses. 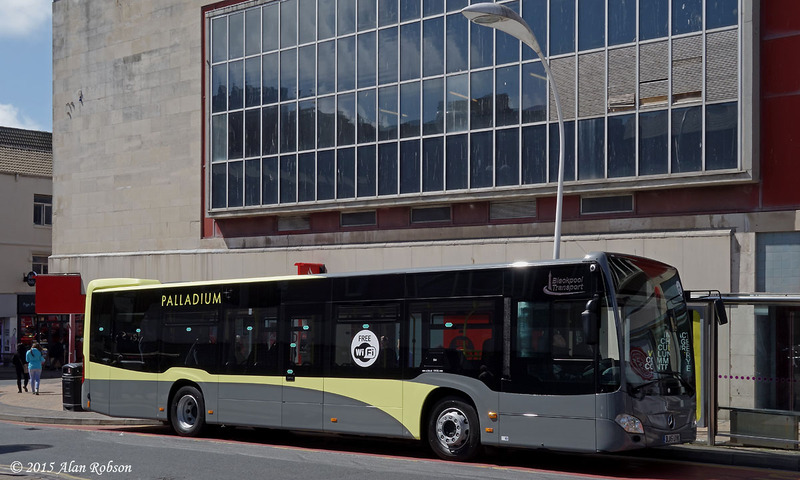 The public launch of the Palladium fleet took place in St. John's Square opposite the Opera House. 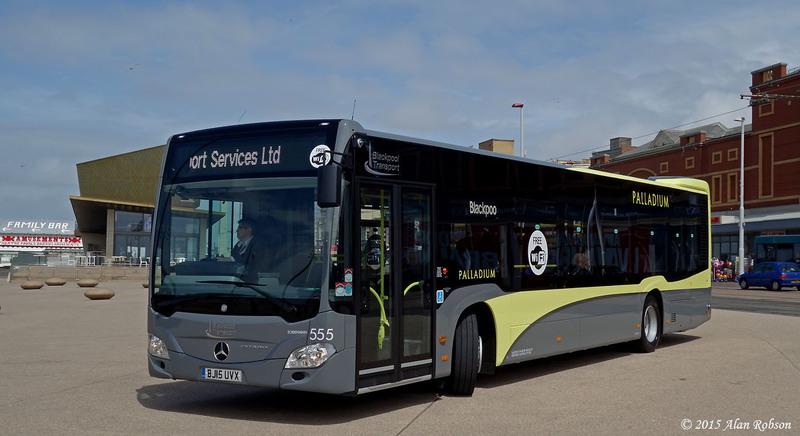 Citaro 551 was the vehicle selected for the event, having been part of the official launch ceremony on the preceding day. 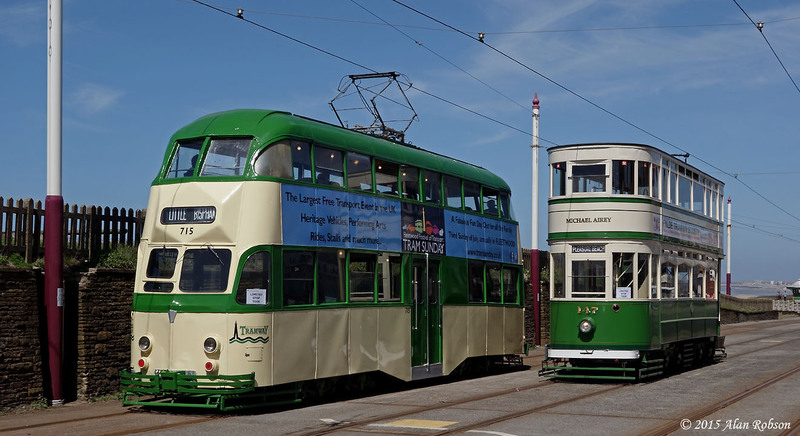 551 was on display for the public to inspect from 1000 until 1500, and Heart Radio were also in attendance throughout the event. 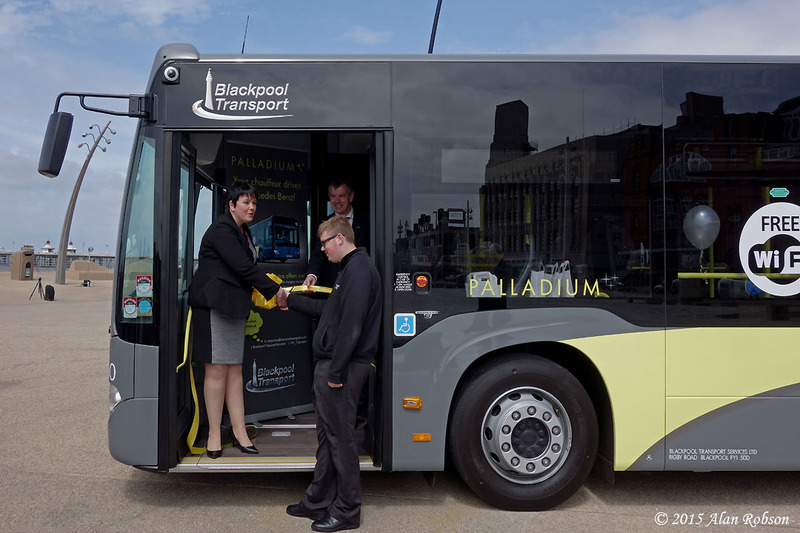 Blackpool Transport officially launched their new Palladium branded Mercedes Citaros in front of Blackpool Tower on Thursday 21st May. 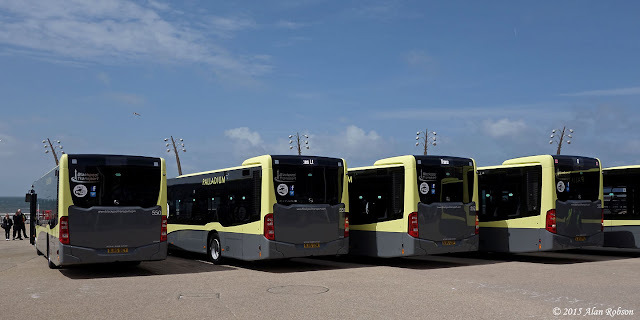 Six Citaros took part in the ceremony, with buses 550 to 555 lined up in numerical order on the Tower headland for the launch. The full batch of ten new buses are numbered 550 to 559, and they are painted light grey with a pale yellow band. The Citaros will be entering service on route 5 from Victoria Hospital to Halfway House on 31st May.